Sometimes I wish I was a kid in the 70’s. All this awesome playset needs is miniatures of Gregory Peck, Anthony Quinn, and David Niven. Apparently Marx was the king of mini-playsets back in the 70’s. In my youth my collection of army guys — based on sheer numbers, plus all the vehicles, plus the wide variety of uniforms — was large enough to stage World War II in my house. I had soldiers for the Allied Forces, Wermacht, Imperial Japan, and a few armies I couldn’t identify. I remember I even had a single German officer in black plastic, who was my Gestapo villain dude; and a single Japanese soldier waving a sword in the air, who always got to be the Japanese general. I even had a ninja brigade — recruited from local arcades with skee ball tickets — to do the Imperial Army’s dirty work. Topping it off was this small set of extra detailed army guys who had distinctly unique facial features and equipment: they were pretty much always the heroes, that crack team of misfits sent on a suicide mission against all odds, or some cliched crap like that. 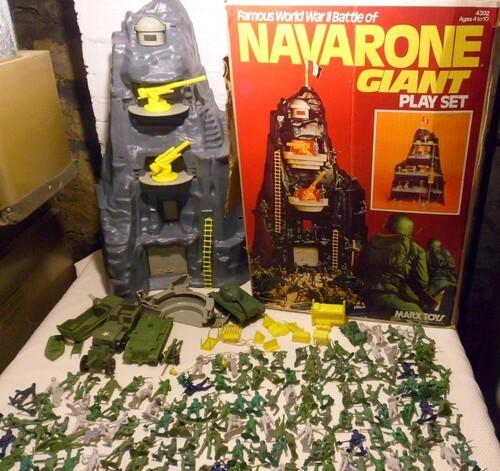 Years later I grew up, and I found out one of my mom’s first grade students LOVED army guys, but couldn’t find them for sale anywhere anymore, so I gave my massive armada a new home. Apparently he lit up like a Christmas tree when he opened the box.